As any parent can likely attest, having kids and starting a family changes your life on so many levels, and on others, not so much. For Kate Tangney, 34, having two kids meant taking a break from her art to be a stay-at-home mom for roughly 10 years. 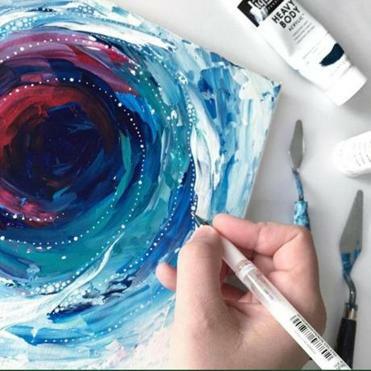 But for the Braintree resident, the passion to create never waned, so in 2015 she returned to art and started posting her distinct and meticulously crafted acrylic work on her page @katetangneystudio. Q. Right off the bat, I noticed that your artwork has a very clear and consistent aesthetic. How did you develop this style of painting? A. When I started out, I actually started as a hand letterer, and I started painting just as a way to make backgrounds for my hand lettering. I had seen so many posts online of people that were doing watercolor backgrounds, but I wanted something a little more bold. I started experimenting with acrylics in order to make backgrounds for the lettering, and once I started painting I wanted to get deeper into that. It was kind of like my gateway into doing abstract work. I think a lot of the detail work I do on top of the acrylics comes from that history of doing lettering on top of the acrylic backgrounds. Q. What made you want to return to art after so many years? A. Creative work has been something I’ve always really been drawn to, and after having kids I started drawing with them. Getting back into creative endeavors with my kids made me realize how much I missed doing my own work. That, and seeing so many other artists on [Instagram] really made me feel like I wanted to be involved in that world again. Q. When it comes to your more abstract work, do you plan ahead or do you figure it out in the moment? A. I think when I started, I definitely planned out my paintings a lot more, but as I’ve gotten more experienced in making abstract art I’ve been approaching it more intuitively. My recent paintings are much more emotive, and they’re much more in-the-moment when I’m painting them. Each mark draws from the one that I made before, and it’s much more centered on emotion than it is on planning. Q. What kinds of emotions do you channel into your work? A. Really anything that I’m feeling at the time, and I think that that’s something people really connect with in terms of abstract work in particular. You may not see a representational form, but a lot of times the emotion still comes through. If I’m having a day that’s especially anxious, then I go paint something that’s a little more frenetic. A lot of times, if I’m feeling really content, then I might do something with a softer color palette and that’s really free-flowing. It just really depends on what I’m feeling at the time, but I think that’s the beauty of abstract work: You can take whatever you’re feeling and just throw it at the canvas. Q. When do know a painting is done? A. That is a really tricky question, as that’s something I still struggle with. As time goes on and as I paint more, I’ve realized that there is usually a point where if you keep going, you’re going to lose a lot of the negative space and the breathing space and you’re just going to overwork it. It’s more of a feeling of looking at the painting and seeing if the marks are coming through, seeing if there is enough negative space, and actually making myself stop, because I do have a tendency to overwork paintings. It’s been trial and error, but I think I’m learning as I go along.